Overhype Studios announced an upcoming Beasts & Exploration DLC for Battle Brothers on their developer blog. We’re very excited to announce that we’re working on a full-sized DLC for Battle Brothers. Yes, you heard that right – there’s going to be a real and meaty expansion with fresh content coming for that game that you like. The name of the upcoming DLC is going to be ‘Beasts & Exploration’. That’s a pretty telling name, and as it suggests, the focus of the DLC will be on introducing new beast opponents in order to bring more variety to every stage of the game, and to make exploring the world more interesting and rewarding. But that’s not all! A variety of challenging new beasts populating different parts of the wilds. Each with unique mechanics and loot. A bigger world to explore, full of unique hidden locations throughout that offer new possibilities and rewards to the daring adventurer. Trophies from slain beasts that can be crafted into charms, potions and other items to customize the look of your hardened mercenaries and benefit them in combat. 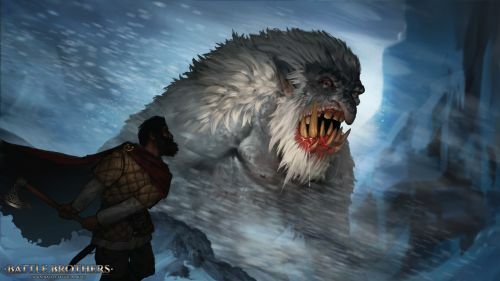 New contracts that have you engage in profitable beast hunting, exploration and more. New weapons, tools, shields, and armor to equip your men with. New paint items that can be used to paint shields and helmets in the colors of your company. In addition to these major features, the DLC will also include countless smaller additions. Just like in the past, all the major points and most of the minor ones will be explained in detail in future dev blogs as we go along, so you’ll always know what we’re working on and why. We expect to be working on this for several months and will announce a release date and final feature list once we’re closer to the finish line. We’re also making good progress on our new game, and will continue to work on it in parallel.